Mobile Disco In Chasetown Staffordshire. We provide experienced and professional Mobile DJs In Chasetown and the Surrounding areas. We supply many different types of Mobile Disco In Chasetown including the following. Weddings, Birthdays, Themes events, Anniversaries, Retirement, Christening, Corporative Events, Christmas and New Year Parties and School Proms. As a successful company we have expanded over the years and now become a one-stop party shop where we can provide all your event services and Products. This includes Mobile DJs, Wedding DJs, Photo Booth Hire, Dance Floors, Led Uplighters, and Confetti Cannons. You may require a complete room decoration which includes, Table centrepieces, Chair and table covers, Led Curtains and Balloon Decorations. New this year we have added the following high-quality products. Large Multi Colour Mr and Mrs Letters, The popular Love letters and the 6ft letter/post box. When you hire a Mobile Disco in Chasetown or any other of our many services we provide you may have many questions you need answering. This may be the first party or event you have organised and may need some advice. You can contact us via our Call back service by filling out the get in touch form or send us an email to our Contact us Page. If you require a detailed quote ideally, we need the following information. How Many Guests will be invited to your event? Your Budget – This helps us to quote you within your budget if possible. We believe we offer a quality service at competitive prices. Mobile Disco In Chasetown – Established In 1994 and still going strong. Mobile Disco Birmingham are proud owners of theses fantastic LED letters. Made from high-quality materials and 4ft tall, painted in a stunning and white finish. These are a must for a wedding and ideal backdrop for photographs. They are 4ft tall, and in pure white, Bulbs can be set to most colours to suit your theme. We provide black LED backdrops where we can change the leds to many different colours commonly purple, pink, blue, red, yellow, white and this is just to name a few. hese dance floors are made from high-quality premium glossy white acrylic and are scuff resistant and beautiful sparkling leds which can be set to many different setting. These chair covers will fit most banqueting chairs. We arrive early in the day, provide all chair covers and fit your chosen coloured sash. We have been providing helium and air filled balloons for over 10 years for many different types of events including Birthdays, weddings, christenings and other special occasions. Mobile Disco In Chasetown Package 1 – Standard Mobile Disco – ideal for smaller venues and events. Quality Sound System, high powered led Powerbar light system, Dj with at least Ten years experience. LED Black Booth Curtain, Music till Midnight. All electrical items are Pat tested and 5 million pounds public liability insurance for extra peace of mind. 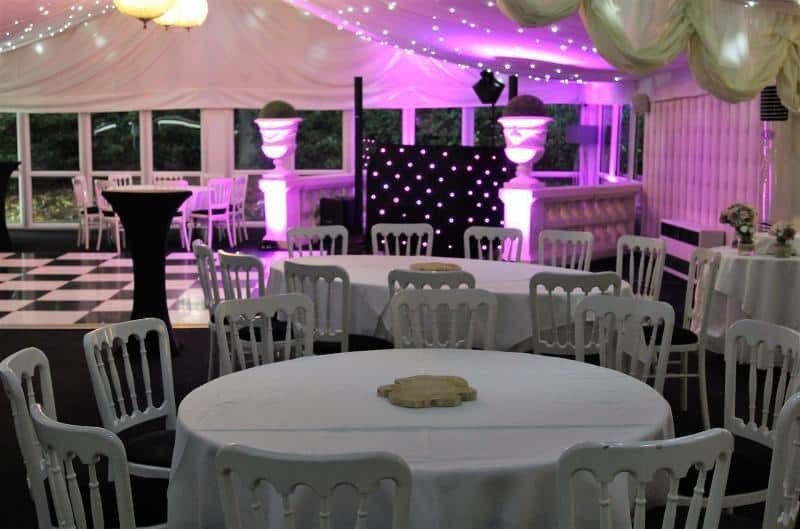 Mobile Disco In Chasetown Package 2 – Upgrade Disco with Uplighters – Ideal for larger venues and events. High-Quality Db or Rcf sound system, Excellent Martin Rush Light system. V2 Black Led Booth Curtain, four uplighters set to your required colour, Music for up to 5 Hours. All electrical items are Pat tested and 5 million pounds public liability insurance for extra peace of mind. Bose L1 with B2 Subs, Synced Martin Rush light system, V2 Tri Led Black Booth (top of the range). Evening set up and up to 5 hours music, Free Large Love letters for Wedding and engagements. 6 up lighters set to the colour of your theme or to suit your venue. All electrical items are Pat tested and 5 million pounds public liability insurance for extra peace of mind. You can update to the Mr and Mrs Letters for a small Fee. Mobile Disco Birmingham believes this is essential to any successful business. We are always here to help and advise you, and we generally reply to all emails within 1 hour. We are always happy when customers send us reviews about our services. Please look at our review page, and we have written confirmation of all our reviews. The main reason why no prices on the website are because customers requirements are generally different. Example customer might want a Disco on a Saturday night in August from 7 until midnight and its 50 miles away. Then another customer might want a 5-hour Disco on a Wednesday night In August, 2 minutes from my doorstep. The Wednesday enquiry would work out a lot cheaper because of its class as off-peak and it’s closer to myself. Being a reputable company providing our services in Chasetown, we have a fantastic reputation through our Testimonials and Recommendations. We also have a Guestbook page on our website where customers can leave honest feedback about any of our services and products after their event. Musical genres from the 40s to the current floor fillers to keep that dance-floor busy. Fantastic high-quality professional lighting systems. This can include led up lighters, lasers, strobes, led backdrops and moving heads.